SARAL BILLING is a complete billing and inventry management solution for businesses. The solution caters to overall operations in billing and inventory management such as quick billing, counter billing, serial number tracking, receipts and issues management at all. This truly multi-tasking solution supports opening of multiple option screens without hampering the ongoing processing in any of the screens. An interactive dashboard facilitates the businesses to administer entire billing, inventory, pricing and reporting operations. 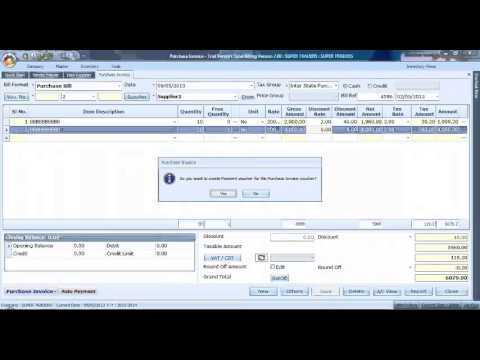 Billing can be done easily using this software within fraction of seconds with option to also use at billing counters. The Dashboard of the software will give the summary of all the transactions done and the relative reports can be generated to help the easy process flow. Stock can be managed according to their Bar-code or Serial Number and hence enabling easy management of Inventory. Saral Billing Software is a quick and easy solution for your Billing with complete stock management. the software having all the latest technology and designed with the simplicity so that the end user can work on it with saral. some of the important features include like- 1. Multitasking which help you to properly utilize the time and quick customer response. Q. Why Saral Accounts? How is Saral Accounts different from other accounting software? Q. Can Saral Accounts generate ST3 form automatically? Q. I am already using another package for accounting. Now why Saral Accounts?